A list of useful online dictionaries and glossaries. Let’s face it, when it comes to medical translation, the international language of medicine is English. And in view of that fact, I’m surprised at how hard it is to find a good German English medical dictionary or glossary on the web. But I’ll keep looking, so do come back for new links which I’ll add as I find them. 2. The Roche medical dictionary - A lexicon of 140,000 medical terms in German with English translations. 3. Medical terminology, English to German, plus German descriptions, for cross referencing purposes, from Morbus Hodgkin. 4. Becker's dictionary of German medical abbreviations (Medizinische Abbürzungslexikon), accepts both English and German abbreviations. I can't praise this little medical glossary enough - I'm amazed how often I need it. So many English abbreviations are adopted into German and so it's great to have this reference work at hand. 5. Wikipedia (http://de.wikipedia.org/wiki/Medizinische_Abkürzungen) is usually a good starting point for most things, and it also applies to medical abbreviations. Once you've found the German medical term, just plug it into a standard dictionary for the English translation. 6. Med Serv is another one, with around 2,700 German medical abbreviations, if you haven't been lucky elsewhere. Karen Schafheutle is German medical translator in my interview series. 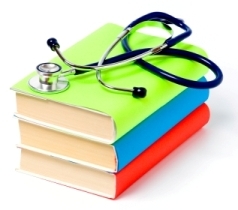 She thoroughly recommends anyone serious about medical translation to consider investing in Medical Translation Step by Step: Learning by Drafting. "I 've not found another book that manages to explain the basics as well as this one." 7. German Institute of Medical Documentation and Information (DIMDI) Medical knowledge online, here the English version. Associated with the German Federal Ministry of Health and a good source of background information on medicine in Germany. An invaluable resource for WHO disease classifications and terminology for the serious medical translator. Detailed vocabulary unfortunately only available for subscription (expensive). 8. Dental lexicon published by the Zahn Forum, with explanations of terms (in German) plus English equivalents as well as links to further information. Rather good. 9. The European Centre for Disease Prevention & Control (ECDC) has just made available a translation memory (TM) of 22,000 words related to infectious diseases. It is available in .tmx format for uploading into your TM software. For more details and to download click here. No luck with the glossaries and dictionaries above? Don’t forget my favorite online dictionary, LEO & its forum term discussions, or the glossaries provided on online translator community websites. Now, if you get serious about medical translation then at some stage there'll be no getting round the need for a serious, well-respected physical/paper dictionary. You'll always need to be able to refer to an authorized source. They can be horribly expensive (look for a used copy!) but are a deductible business expense. I've identified some options for you here. PS: If you know of any good German medical glossaries that you've found useful and would like to recommend, then we'd love to hear from you! Use the form below (I will NOT pass your details on to anyone!) to submit your suggested source, and we'll add it to the list. Many thanks for contributing to our German medical translation database!